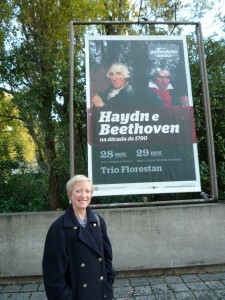 This photo shows me outside the Gulbenkian Foundation in Lisbon, standing beside the poster for the Florestan Trio’s three concerts. On the day after the concerts, Bob and I caught the old tram up the hill of the Alfama district to visit the castle. While we were standing on the crowded tram, Bob’s wallet was stolen. We knew nothing about it until an Italian tourist, sitting near us with his wife, tapped me on the shoulder and handed me Bob’s wallet. I couldn’t imagine how Bob’s wallet came to be in his hand until he indicated to me what had happened: a pickpocket standing next to Bob had stolen the wallet, the Italian tourist had seen it happen and had reached forward, grabbing the pickpocket’s arm and wrenching the wallet away from him. We knew nothing of it until I turned to see the Italian man handing me the wallet and the pickpocket frantically jostling his way to the back of the bus. The pickpocket jumped off at the next stop and disappeared. At the following stop, there were a number of police standing about. By this time the whole tram was full of the excited chatter of passengers exclaiming to one another about the incident. As we drew up next to the police, several passengers leaned out of the tram windows and told the police what had happened. The police asked us to get off the tram and tell them ourselves. So we dismounted, and so did the Italians. As I spoke no Portuguese and the police no English, we spoke French. The Italian man was by no means eager to explain his part in the event, but when I had told the police of his brave action, they all turned and congratulated him. I made a speech of praise in schoolgirl French, and then we all shook hands and wished each other well. Afterwards, we realised what an extraordinary thing our hero had done, especially when the Lisbon guidebooks advise tourists not to resist if they are robbed. He came to the aid of a complete stranger when it would have been so easy to turn a blind eye. He will probably never see this page, but we will always remember him with admiration. This entry was posted on Thursday 3rd December 2009 at 11:54am	and is filed under Concerts, Daily Life, Florestan Trio, Travel. You can leave a response, or trackback from your own site.